Learning to play again brings freedom to be yourself. Gerald Heard visited Georgia O’Keeffe at Ghost Ranch in 1937. He had an interest in Eastern religions and metaphysics. One morning, O’Keeffe found Heard’s footprints around the tree where he had been dancing as well as a cryptic inscription he had etched into the earth at the base of the tree. “Gerald’s Tree was one of many dead cedars out in the bare, red hills of Ghost Ranch. From the footmarks around the tree, I guessed he must have been dancing around the tree before I started to paint it. So I always thought of it as Gerald’s Tree. “ Georgia O’Keeffe. O’Keeffe painted two versions of the tree, indicating its importance to her. 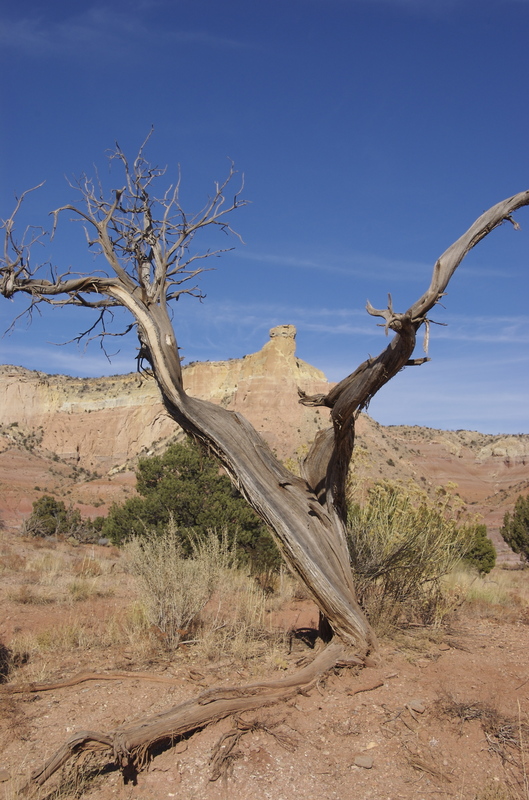 On a visit to Ghost Ranch, I heard this story and was captivated. David took this photograph in 2008. The tree has not changed in the years since O’Keefe painted it. That this twisted tree, would be the subject of several paintings fascinates me. To see color in dirt takes a willing eye. It is easier to see beauty in vivid flowers or lush forests. The desert makes you work to see it’s unique beauty. Over the years, I have made many trips to theSouthwestt. One of my favorite pieces of writing is from the novel, Song of the Lark by Willa Cather. This takes place after an intense period of her life as an opera star. She goes to the desert to rest and recuperate. Sitting down in the dirt, or the grass, and letting the sounds and small movements of the tiniest creatures catch your attention is a way to play. Play comes naturally to children. They can play by dancing round the mulberry bush, or by laying down in the tall grass and watching the clouds move across the sky, creating castles and animals in their mind. Or watching a line of ants as they carry their burdens along their well-worn tiny paths, letting imagination carry them away. Wake up early, dance around the base of a tree and find a communion with nature. Being spontaneous, playful, and indeed silly gives freedom from the restrictions we put on ourselves. Think of the ways you play. Write down the most vivid times you played in the last five years. What do they have in common? What do you feel as you remember them? Then think back on some of your earliest memories of playing when you were small. Do these experiences have anything in common? Being mindful and playing are ways to find the ever-elusive joy we often let slide by for more routine tasks of life. Give in to the urge to dance in the early morning, or in the starlight and watch as you come alive again.